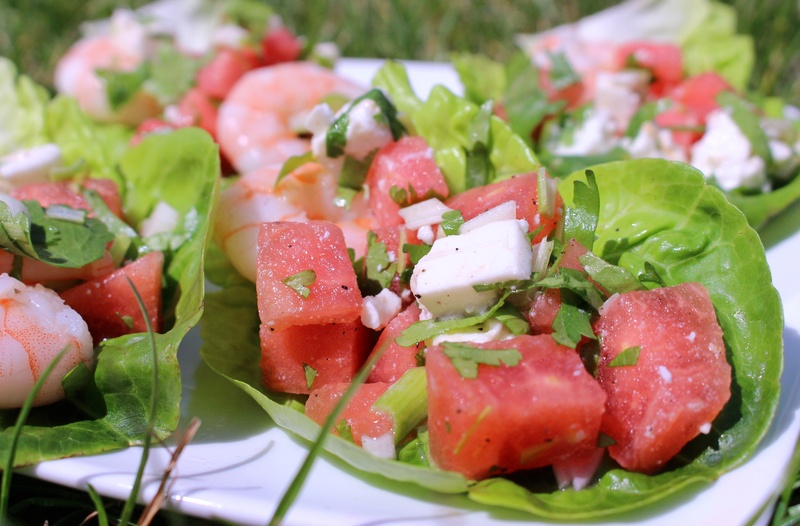 Prawn, feta and watermelon lettuce wraps | dash.drizzle.dollop.devour. A crisp, crunchy, refreshing light lunch for a hot summer’s day. This is a quick dish to assemble, so minimal risk of the sun disappearing behind a cloud whilst you are in the kitchen. Sweet, fragrant watermelon is perfect combined with the tangy, salty flavour of feta cheese. The addition of prawns and a chilli and lime dressing makes for a lunch bursting with flavour. And so pretty too! I bought a pot of ready-prepared melon rather a whole fruit, although the cubes in the package were a little large for this, so I cut them down into about 1cm pieces. Mix together around 100g of watermelon cubes with about 25g feta, also cut into similar size pieces. Add around 100g ready cooked prawns. Finely slice 2 spring onions and add to the mixture. Spritz over the juice of half a lime, a whoosh of tabasco (or finely sliced red chilli if you have it) and a scant drizzle of light olive oil. A generous hand with some fresh chopped mint and coriander plus a little black pepper finishes it nicely. Pile the mixture on top of little gem lettuce leaves. Makes around 4 topped leaves which serves 1. Shopping list: little gem lettuce, pot of watermelon chunks, small block of feta, coriander, mint, 100g prawns, lime, chilli, olive oil, spring onions. Loved this dish, it was so flavourful. The mint and coriander was a good combination. I look for fairly easy options and this was one so will use it again!